The Nikon Coolpix S2600 is a compact camera in the Style range of cameras, boasting a 14 megapixel CCD sensor, 5x optical zoom, 19.5mm thin body, 720p HD video recording and an EXPEED C2 image processor. Targeted at the point and shoot crowd, the Nikon 2600 features a multitude of automatic modes to make picture taking easy. Priced around £65, the Nikon Coolpix S2600 is available in pink, red, gold and black. As part of the Style range of digital compact cameras, the Nikon Coolpix S2600 is a good looking slip of a camera that's a mere 19.5mm from front to back. That makes it easy to slip into a pocket when you're not taking pictures. The 5x optical zoom is small and unobtrusive. The camera comes with an image stabiliser but it's not optical which reduces the size of the lens as well. The e-VR (electronic Vibration Reduction) uses a mixture of features to get the steadiest shot such as High ISO, Motion Detection and Best Shot Selector. High ISO will choose an ISO setting appropriate to get a still shot. It will use anything up to ISO 3200 which could cause problems with noise. Best Shot Selector will take ten pictures and choose the best from the ten. Motion Detection most accurately describes what the system is supposed to be doing. It works by compensating for camera and subject movement. Only a slim flash and AF beam transmitter accompanies the lens on the front. On top of the Nikon Coolpix S2600, the brushed metal body is split through the middle by a chrome strip. The strip is home to the power button; a small, round button circled by a green power light. The larger shutter release button sits atop the zoom rocker. It's all going on at the back though. This is where you'll spend most of your time so it makes sense to put everything here. At the top a small light blinks to indicate the flash is charging up. Next to this is a small thumb rest and next to that is the direct video button. The main control buttons are sat in the usual formation of a command ring with an OK button in the centre and four buttons surrounding it. The green camera button selects the mode that you'd like to shoot in. There are three options: Auto, Scenes and Smart Portrait. There are 19 scenes to choose from. Well, 18 if you don't include the first Scene priority mode. This mode will analyse the picture you're shooting and select the correct scene such as selecting macro when it sees a closely focused object. There are a few modes that have direct access so in the heat of the moment you're not rooting around the menu systems trying to change something. On the command ring you can access flash, self-timer, exposure compensation and the macro mode. If you decide to go in the menu after all, the button is situated at the bottom of the camera across from the delete image button. Once in there, use the command ring to navigate your way through. There are three tabs in the Nikon Coolpix S2600's main menu: Shooting, Video and Set-up. Playback has its own menu which we'll look at later. In the Shooting menu, you can change typical shooting options such as the resolution, white-balance, ISO and drive. There's also more in-depth modes such as Colour modes, AF area mode and Autofocus mode selection. The latter chooses between continuous focusing or not. Should you choose continuous, this is good for moving subjects as it will anticipate where the subject will be and follow the focus. However this is a drain on the battery so it's best to turn it off when you're not shooting a moving target. To help with moving subjects, you can also adjust the focus mode to reflect your photography. Choosing this option has five options: Face priority, Auto, Manual, Centre and Subject tracking. The last option will help with the continuous focus as when it locks on the subject, it will stay with it regardless of where it moves in the frame. 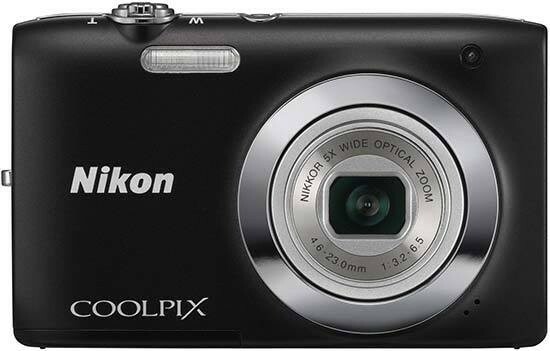 The Nikon Coolpix S2600 seems to be well built considering the price it is. The casing looks metal but sounds a little more like plastic when tapped. We think it's metal though. The screen is surprisingly small at 2.7 inches. A typical size is 3 inches on today's cameras and although the difference is negligible, numbers are what customers see. The screen is bright and clear. It doesn't suffer any motion blur or purple banding when it encounters a bright light in an otherwise dark scene. The battery compartment is located on the bottom of the camera. It takes a dedicated lithium ion battery and the memory card slots in by its side. The S2600 accepts up to SDXC cards. We'd like to have seen a lock on the battery door but you can't have everything. Nikon are well known for putting flimsy rubber covers on the USB ports of their lower specification cameras and the S2600 is no different. Nikon have perfected the menu system on their digital compact cameras to make them as easy to use as possible. Even a complete newcomer to photography will be able to get hold of it easily thanks to the clear and concise user interface. Start up time is noticeably slower by around half a second. The main issue with this response is the focusing. We tested the Nikon Coolpix S2600 several times and it took us a few attempts to get the camera focused before it took a picture. Continuous shooting isn't too bad for a camera in this class. It takes pictures at around 1fps (frames per second) although looking at the milliseconds that it recorded, given enough time, it was taking longer than a second to take a picture meaning there would be an overlap after around 20 seconds. It took a further eight seconds to download these ten full size 14 megapixel fine setting pictures to the memory card using the EXPEED C2 processor. In playback mode, the pictures will be displayed one at a time. They can be scrolled through using the command ring and pressing left and right. Alternatively you can press up and down to perform the same action. The information on the screen will show basic shooting info such as date & time, file number, resolution setting and position of the image in the folder. These are all basic details and can be turned off in the Main menu under Monitor settings if you wish. The zoom can be used on the pictures you've already taken. Zooming in is useful to ensure focusing is correct (called pixel peeping) while zooming out will display the images as a thumbnail grid. You can perform this action three times and still show thumbnails. Doing it again shows a calendar and you can select the date you wish to view. In the menu you can rotate the picture, change the size to a small picture, add a voice memo to the picture you were on when you went into the menu or copy the image from card to camera or camera to card. This last option is particularly useful if you have to use the internal memory and wish to download your pictures via card reader. IN the box, you get the camera, lithium ion battery, charger and cable (the cable doubles up as the USB cable for downloading to the computer direct from the camera), video cable to view pictures and video on a tv and there's also a wrist strap. The large looking booklet is only a Quick Start Guide and is in multiple languages. The full manual is on a separate disc included in the box. A second CD holds installation software drivers for ViewNX2 which is Nikon's own photo viewer.